If you’ve recently decided to undergo orthodontic treatment, you may have a few questions about braces, how they work, and what to expect from your overall experience. 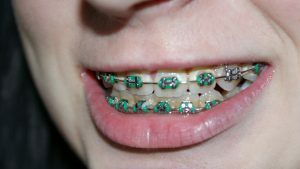 Here are answers to some of the most frequently asked questions about braces so you can go into your treatment knowing exactly how everything works. The answer to that question varies from patient to patient, depending on the severity of the orthodontic issues that are being corrected with your appliance. However, the average length of time a patient is required to wear braces is between 18 months and 2 years. Your orthodontist will let you know how long you can expect to wear your braces during your initial consultation. What kinds of orthodontic appliances can I choose from? These days, many different types of braces are available for you to choose from. They can be made from ceramic, plastic or metal materials, and can have wires that are virtually invisible, if you prefer not to have them be noticeable. The individual brackets on each tooth can be either silver or clear, and you are allowed to choose from a variety of colors of tie for each bracket. Think of braces as jewelry for your teeth! The braces of today are much more stylish than the old-school metal bands, and you can have fun with them as an accessory or make them as undetectable as possible- the choice is yours! Your orthodontist will supply you with a list of dos and don’ts, as well as guidelines for proper brushing and flossing techniques, when you get your braces put on, but the basic rule of thumb for proper care for your braces is to treat them the same way you treat your teeth. Brushing twice a day, making sure to carefully brush around each bracket, and then flossing your teeth with special flossers designed to get into tight spaces between your braces can help to avoid tooth decay, bad breath and gum issues down the road. While you may experience discomfort when your braces are initially put on your teeth, and there may be some mild pain each time you get an adjustment during your treatment, it is normally mild enough to be alleviated with an over-the-counter painkiller such as Advil or Tylenol. Also, you may initially experience discomfort on the inside of your mouth while the delicate skin gets used to rubbing against the brackets and wire, but this will soon pass as your mouth gets used to the feeling of braces. Orthodontic treatment is the key to a beautiful, dazzling smile that you can be proud of. If you think it’s time to get braces, Nance Orthodontics is Herriman, UT’s premier orthodontic center. Dr. Nance and his staff will work with you every step of the way to make sure you have the best possible experience and results you will love! Call us today at 801-789-4800 to schedule your initial consultation. We are looking forward to working with you!